Herbert Hedley Wilson was born on the 26th August 1895 in Yeadon, the second of Francis Henry Wilson, a designer in a woollen mill, and his wife, Charlotte Ellen Armitage Wilson. On the 29th September 1897, another son, John Stanley Wilson was born. John Stanley Wilson also served in the war (see his pages) and gave his life in 1918. In April 1901, the family were living at Croft House, Yeadon and other children, Rowland Keighley Wilson and Arthur Fayers Wilson, were born in 1902 and 1905 respectively. In April 1911, the family, Francis Henry, Charlotte Ellen Armitage, Francis Joseph Haigh, Herbert Hedley, John Stanly, Rowland Keighley and Arthur Fayers, were living at 88 Grange Avenue, Chapeltown Road in Leeds with a 20 year old Lady's Help, Lilian Robinson. The family must have moved to Collingham after 1911, and Herbert Hedley gave his address as The Grange, Collingham in his military service record. Herbert enlisted on the 27th August 1915 in Leeds into the Army Service Corps (ASC) with a service number S4/128048. The Army Service Corps (Royal Army Service Corps after 1918) provided the food, equipment, ammunition, horses and vehicles needed to maintain and supply a vast army on many fronts. At its peak, the ASC numbered an incredible 10,547 officers and 315,334 men. The ASC were organised into Companies, each fulfilling a specific role, the overall organisation being quite complex as some ASC men served in ASC companies but many were attached to other units. ASC section existed for Horse Transport, Mechanical Transport, Remounts (responsible for provisioning of horses and mules, Labour Companies, Supply (including Filed Bakeries and Butcheries) and Base Depots usually used for stores. ASC men served often in "Lines of Communication", an Army term used to describe what today we might call Logistics: the supply lines from port to front line, and the camps, stores, dumps, workshops of the rear areas. ASC service numbers give some indications of a man's role and Herbert's prefix of S4 shows he worked in Supply, and he had been recruited into the New Kitchener 4th Army. Herbert's service record has survived and gives a detailed picture of his time in the Army. After enlisted ment on the 27th August 1915, Herbert attested at Aldershor ASC Depot on the 30th and was posted as a private to 344 Depot Unit of Supply (DUS). On the 12th March 1916 Herbert was transferred to 346 DUS and just 13 days later was promoted to Lance Corporal in 346 DUS, 41 Line of Communication. Promotion continued and Herbert became an Acting Corporal in the same unit on the 17th April 1916. On the 1st May 1916, Herbert embarked in Southampton with 346 Depot Unit of Supply and disembarked the following day in Havre as part of the Expeditionary Force. Herbert transferred several times after that: on the 2nd September 1916 to No. 8 Line of Communication (LoC) Supply Company (Coy), then again on the 12th January 1917 to No 29 LoC Supply Coy and on the 16th April 1917 to No. 30 LoC Supply Coy. Herbert was granted leave from the 13th September 1917 to the 24th September and on the 12th November 1917 was promoted to Corporal, a day before joining No 6 LoC Supply Coy. Herbert then left France on the 17th as part of the British Forces in Italy. On the 10th February 1918, Herbert was admitted to 51 Stationary Hospital in Anquata, but his record does not say if this was due to injury or sickness. He rejoined 32 LoC Supply Coy on the 20th February. Herbert moved back to France and the Expeditionary Force there on the 21st April 1918 and was posted to 17 LoC Supply Coy on the 18th May 1918. On the 5th June 1918, Herbert's record shows a change of address for his next of kin to The Grange, Collingham, so it is likely that this is when the Wilson family moved to Collingham. Herbert was granted 14 days leave on the 27th September 1918 - perhaps in part due to his brother being killed in action in July 1918. 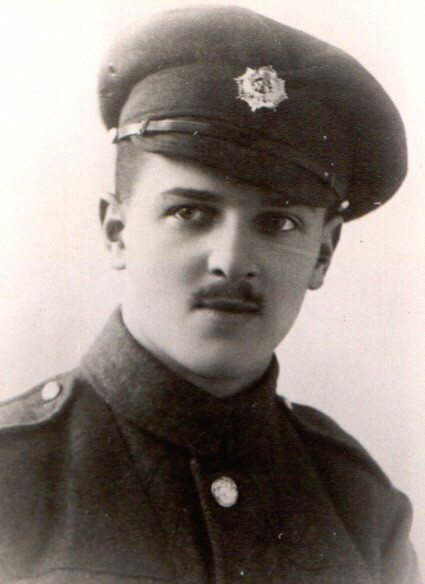 Herbert returned to duty on the 11th October 1918. After the end of the war, another transfer, on the 3rd December 1918 followed to 31 LoC Supply Coy and Herbert was promoted to Acting Sergeant on the 3rd December 1919 when he joined 17 LoC Supply Coy. After a further period of leave (11th - 26th April 1919) he served in Havre with 17 LoC Supply Coy, before his final transfer to No 3 LoC Supply Coy. on the 11th June 1919. Herbert came back to the UK on the 15th August 1919 and was released from the Army on the 13th September 1919. After the war, Herbert married (in 1921) to Phyllis Edith Hield and they had three children, Audrey Armitage Wilson, Raymond Stanlet Wilson and Kathleen Joyce Wilson. By 1939 the family lived at 12 Austhorpe Avenue, Leeds. Herbert Hedley Wilson died in 1982 in Ulverstone, Tasmania.